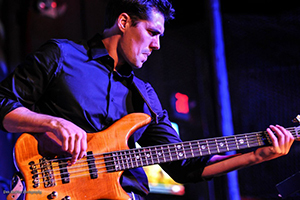 As the son of a professional, touring musician, Dominic took up bass and went on tour with his father at the age of 11. As a teen, Dominic started racing BMX and within 6 months he was in national races in his home province of Quebec, Canada. At 19 he won the Canadian Championship and moved to France to pursue his BMX career as a professional rider. After training in France for a year, he placed second in the world. In 2004 Dominic moved to the US, hung up his bike and started his “real” career as a musician. He’s been performing professionally and teaching for over ten years. Dominic is bilingual, French and English and teaches both guitar and bass.